World champion saddles up to launch cycling fundraiser! Saints, England and world champion rugby player Harry Mallinder will be switching the funny-shaped ball for a bike in support of Northamptonshire’s favourite annual fundraising ride when he launches Cycle4Cynthia 2018 next week! Cycle4Cynthia has been given a massive boost with the news that leading commercial law firm EMW Law LLP is leaping into the saddle as headline sponsor! This year's Cycle4Cynthia will be launched at Franklin's Gardens at 6.30pm on Tuesday 27th March 2018. Be sure to add the date to your diary! The best £100 you’ll ever spend? When you run a company, £100 doesn’t get you much these days does it? A few reams of copier paper perhaps. Maybe a new set of ink cartridges if you’re lucky. Olympic cyclist adds county gong to medal haul! Riders can buy their Cycle4Cynthia jerseys for just £25 with proceeds going to the Hospice. Olympic cyclist to start county bike ride! Double Olympic medal-winning cyclist Becky James will show her continuing support for Northampton’s Cynthia Spencer Hospice by setting off the riders at the county’s favourite annual fundraising bike ride, Cycle4Cynthia, next month! Wimbledon had flying ants and the Tour de France had flying parasols, but thankfully the only thing that might fly past you at the county’s favourite bike ride are cyclists dressed as a superhero, a bunch of daffodils or even a slice of pizza! Energy boost for cycle ride! 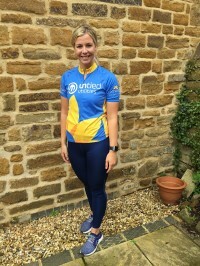 It is more used to providing expert advice on everything from electricity bills to smart meters, but Northampton-based energy consultancy Untied Utilities has just had its own brilliant light bulb moment – becoming the lead supporter of Northamptonshire’s favourite annual bike ride, Cycle4Cynthia! Want to live longer? Reduce your risk of cancer and heart disease? Then cycle to work, say scientists!